The Camera Lucida by Evelina Domnitch & Dmitry Gelfand (RU/NL) is a reminder of the days when the latest innovations of science were presented to people by nomadic gypsies, in a form of mysterious theatre. Evelina and Dmitry are the ceremony masters of this artwork, guiding the audience in a completely dark room to show them a spectacular new discovery in physics. 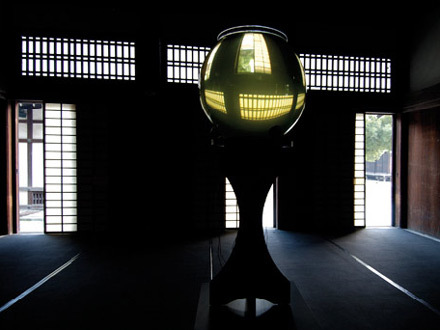 Created in collaboration with scientific laboratories in Japan, Germany, Belgium, Russia and United States, the Camera Lucida (lucid or light chamber) installation allows one to directly convert sound waves into light by employing a phenomenon called sonoluminiscence: ultrasound within liquid causes micro-bubbles of gas to implode, as which point they become as hot as the Sun and emit light in the shape of sound waves. The Camera Lucida by Dmitry Gelfand & Evelina Domnitch (RU/NL) will be exhibited 8-30 March at Kiasma Mediatheque. !!! Saving Myself installation got broken during transportation, and unfortunately will not be presented at Pixelache Helsinki 2008 !!! "My own interest in the atmosphere, and its representations is linked to an ongoing project, Public Smog, which involves a series of attempts to create a *clean-air* park in the atmosphere. 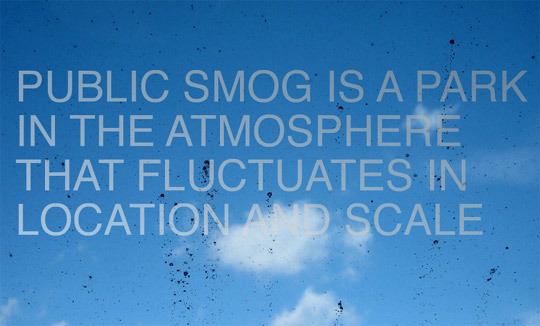 Public Smog is concerned with the atmosphere as a social, political, and economic formation. Actions to create the park have included purchasing and withholding emissions from regulated greenhouse gas markets in Southern California and in the European Union, and an attempt to submit the Earth's atmosphere for inclusion on the UNESCO World Heritage List. And anyone who wants to can construct Public Smog at any time, through any activity that creates it. In the process of attempting to create the park, the project considers current atmospheric geopolitics, particularly economic and political efforts to commodify and control this singular global system through markets, international law, treaties, and police power." 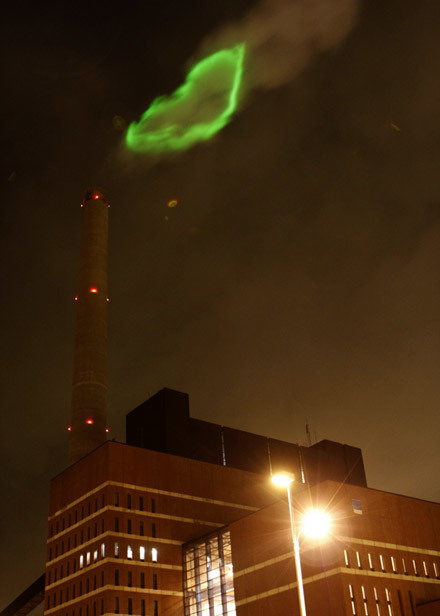 Nuage Vert uses the chimney emissions of the Salmisaari power plant in Helsinki as a canvas for illumination. The installation consists of tracking, drawing and projecting a laser image onto the contour of vapour, adjusting its shape and size to the current levels of electricity consumption by the residents in Ruoholahti and neighbouring Lauttasaari.The chimney and emission are an environmental sculpture and a community measuring tape, but there is an irony here: Nuage Vert aestheticises an icon of industrial pollution while seeking to draw the viewer’s critical attention to it. By becoming a sign of wonder, a spectacle, a terrible beauty, a space is opened up for the viewer. Nuage Vert project took place in Helsinki 22-29 February 2008, Pixelache Lounge Exhibition will present a documentation video of Nuage Vert. This work has been an attempt to make visible and audible the human rhythms of birth and death. Using the U.S. Census Bureau as a source of statistical information, every time a new human being is born in the planet a light bulb turns on, consequently every time a new death arises a hair dryer turns on. Presently the human birth rate is calculated in 4.2 births per second, while the death rate is only 1.8. "...Through watching my host's constant engagement with her phone, I learned of a system that Cameroonians had invented, to circumvent the expensive foreign owned cell phone networks, called “beeping.” A beep is a called placed and hung up after one ring. Through a context sensitive system, I learned that Cameroonians had developed beeping into a complex language capable of a range of communications. It was after a walk through the market, past the church where my host siblings sang in the choir, that I decided to buy a cell phone for God and to invite people to beep him. I formed a small collective the S.D.C.D., the Society for Direct Communication with the Divine. The first members were my host siblings Veronique, her oldest sister Suzy, Suzy’s boyfriend Patience, a student at the University of Yaounde I, and his roommate Gerard. They recruited a couple more of their friends and together we discussed the project. I said very little except that I wanted us to facilitate a conversation around the installation of God’s cell phone." This multi layered installation is an attempt to portray the complexity of the transformations taking place in the current Indian society. The installation houses 5 narratives of technology usage in present day India, within a ‘Pandal’. The narratives are from an ethnographic study of Internet cafes, conducted in over 7 Indian cities. A Pandal is a temporary urban diorama which is put up collectively on the streets by people in a neighbourhood celebrating the idea of ‘Shakti’. This usually takes place in the month of September or October during Navratri, a post harvest festivity in India. Shakti as a female form is the manifestation of power, with wealth on her right and knowledge on her left. The comparison here is of Shakti to technology, wealth to market and knowledge to literacy. The 5 narratives portray how technology is affecting the market and literacy in the current Indian context. The ‘Pandal’ in actuality of context of the Indian streets, not just houses the religious deity but also conveys a social message of the current times through the diorama. The ‘Pandal’ structure here at Pixelache has a sheath of imagery from Kolkata and Siliguri taken during Durga Puja in September 2007. The attempt of the installation is also to convey the metaphor of the viewer as a consumer of technology as if it was consumption of faith. 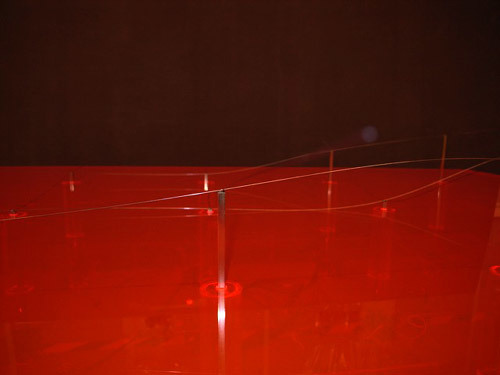 A moving mechanical surface controlled by its environment. Michel Bussien is currently studying at Konstfack in Stockholm, Sweden. 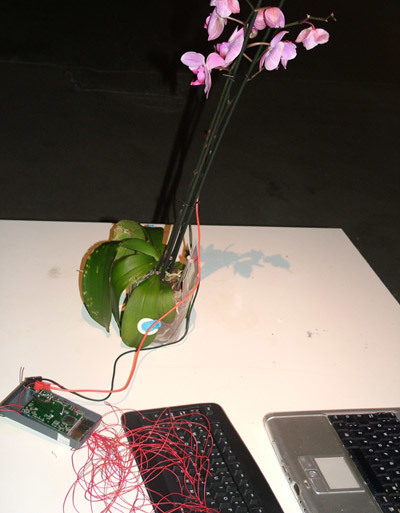 "I measure small electrical signals from a flower. Passing through a software the signals are translated into different words, depending on the frequency of the signal. The words are then put in to a blogg on the internet. The flower is trapped in an artificial eco-system whish climate is depended by the number of persons visiting the blogg. We can spend our whole life in our apartment. Thanks to the internet we can work, ordering food, and even meet our lovers, we can check the weather outside our window without looking out from it. Even if we know we should be careful and questioning the sources on the internet, it is allot of information that is taken for granted, like in real life. More and more we are starting thrust our computer screens just as we trust our senses. How does this effect our vision of the world, Are we stepping deeper into the cave of Plato, communicating not only with shadows, but with the computer screen? What if the poem that made you burst into tears was not written by anyone made of flesh and bones. What if the nice person you meet on the internet is a killer. What if he didn’t exist? What we believe is the truth, IS the truth for whom ho believe it. The flower is a person sitting in an apartment in front of a computer, for those who believe the flower is a person. When the flower is typing on its blogg it exist on the same level as a person in front of its computer." Christer Chytraéus is currently studying at Konstfack in Stockholm, Sweden. Kitchen Budapest - The AniMobil is an animation software which uses the camera of mobile phones to make stop-motion animation. The result can be saved as an animated gif and uploaded as an avatar or as a simple video and than uploaded to any youtube-like sites. 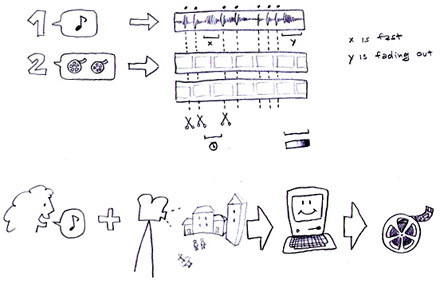 Kitchen Budapest - Autocut: sound-based video recontextualizer. Animata is a real-time animation software for live performance, with the aid of which we can easily create scenes with virtual puppets. 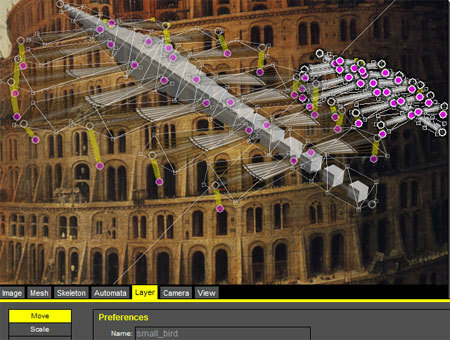 This software is designed to create an interactive background for theatre, music and dance performances, and it can also be used for the visual design of promotional screenings. The software can be run on multiple operating systems, like Mac OS X, GNU/Linux and Windows. It can be easily connected to other applications (Max/MSP, Processing, VVVV, etc.) receiving live input from various physical sensors, microphones and cameras for presentations, performances and improvisational events. 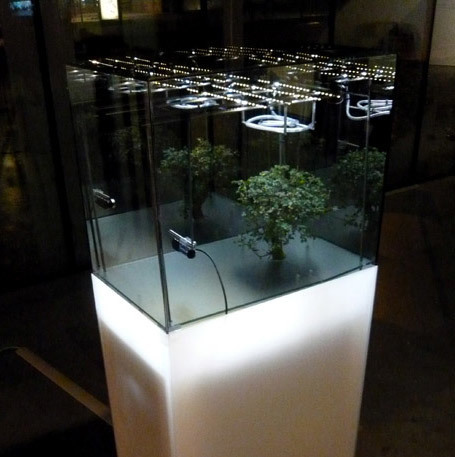 Arbour Light, an intelligent lighting system can reproduce the visual atmosphere of natural phenomena. 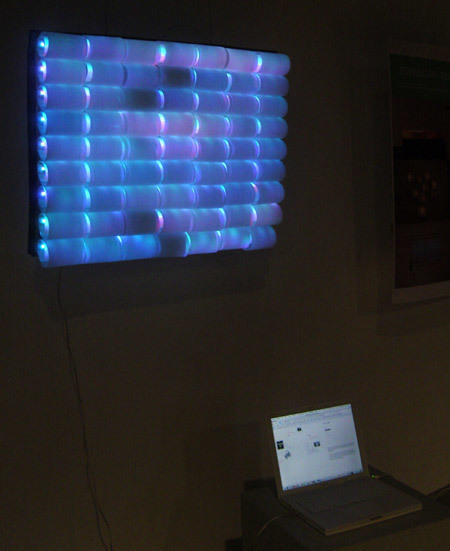 It recreates the ambient atmosphere rather than a photographic image, hence it extends communication into non intrusive modalities. We are currently working on the Arbour Light website, what we imagine like a sort of web-community. 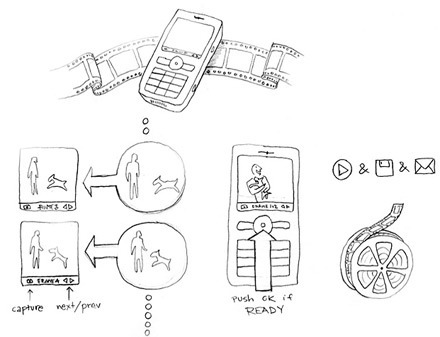 Among others the site will give opportunity to reach an ambient database. It is based on the videos of Arbour Light owners and “phenomena-collectors”. It is also of importance that the pixel are very low cost and prepared for a DIY distribution; folded paper, flatcable, etc. 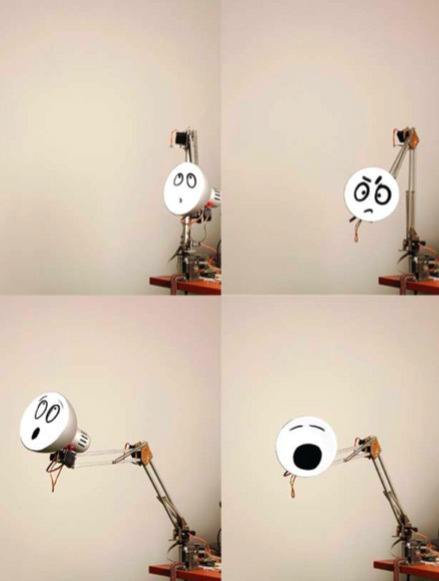 Mllamp project is an experiment for simulating emotions with putting minimal intelligence into everyday things. If it has some anropomorph character, the viewer can easily go into with recognizing human gestures. The interaction between the pair of Mllamps associated with human behavior can be recognised as emotions in lamps. 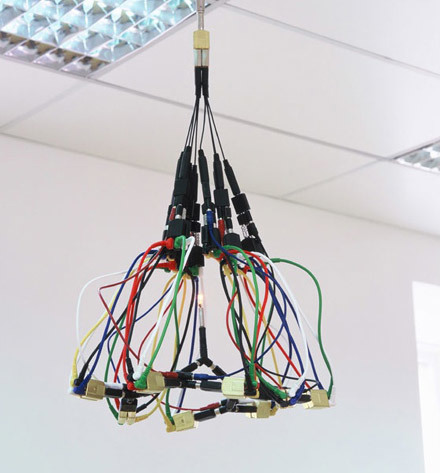 Self-Portrait as a Pataphysical Object is a kind of chandelier created from audio adapters and cables with a single small bulb at the centre. An object in its own right, the chandelier, could hang in the lobby of the Kiasma as a representation of Lauschmann’s humours and DIY aesthetic, which draws on the everyday and subtle nuances of human relations. Scottish artist, Torsten Lauschmann originally trained as a photographer and filmmaker but currently works across various media. His work has been shown internationally and he has performed as a musician, VJ and solar-powered busker known as Slender Whiteman. Examples of his mixed media projects include Misshapen Pearl (2003) a film about a street lamp’s function in the commercial world and World Jump Day (2005), an Internet campaign, which attempted to reverse global warming through a synchronized single jump across the globe. 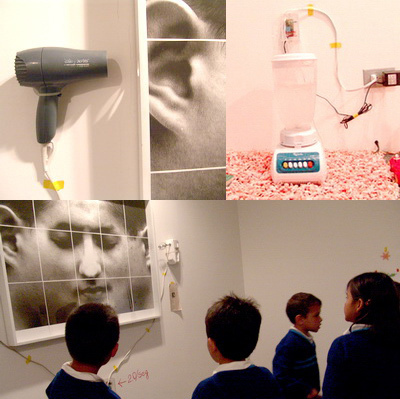 His most recent work, Piecework Orchestra (2007) is an orchestra of machines, which Lauschmann controls to create sound-compositions, has been created using everyday house-hold objects.